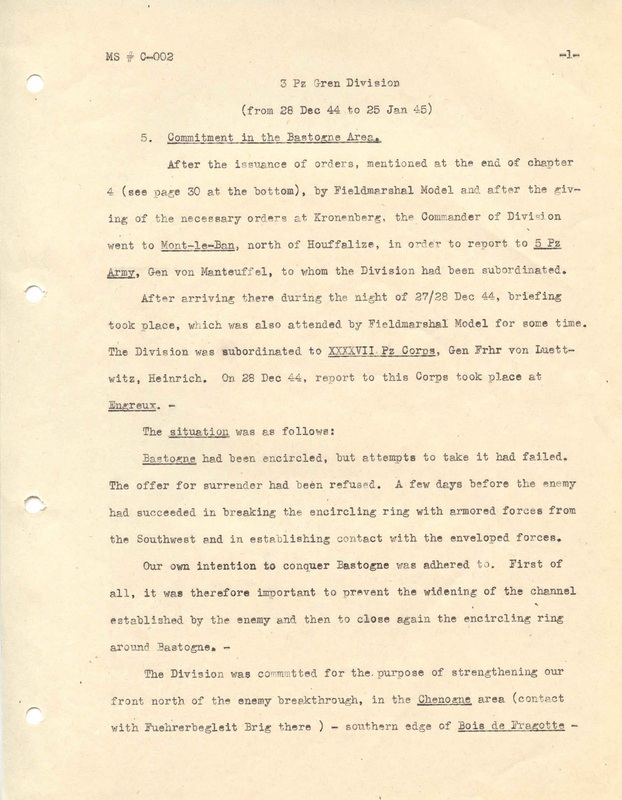 A useful primary source for German military operations in World War II is the manuscripts of the US Army Historical Division’s Foreign Military Studies program. 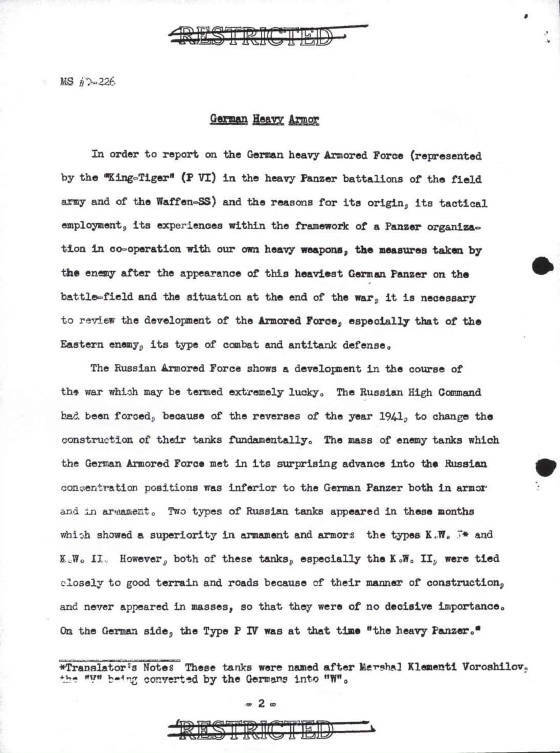 These studies, written between 1945 and 1959 by former senior officers of the German Armed Forces, cover nearly every aspect of the German war effort. Many, but not all, manuscripts were translated into English. The FMS manuscripts vary in subject matter and quality. As with all historical documents, each study must be evaluated for accuracy and bias; of which the ETHINT and early A, B, and D series manuscripts are the least factual because they were written from memory without access to official records. The C-Series are regarded as the most reliable. In sum, critics believe the German authors wrote a self-serving view of the war. However, many studies were valued enough by the US Army Center of Military History to be used in the official history of the United States Army in World War II and the Army Historical Series accounts of the War in the East. Reportedly, they were also used by German Armed Forces Military History Research Office (Militärgeschlichtliche Forschungsamt or MGFA) as source material for its series on Germany and the Second World War (Das Deutsche Reich und der Zweite Weltkrieg). Guide to Foreign Military Studies 1945-54: Catalog and Index, published in 1954. It provides a summary of each manuscript and has a well organized index. See the "Research" page to download a copy. Supplement to Guide to Foreign Military Studies 1945-54, published in 1959. It lists and describes those C, D, and P series studies produced after 1954. See the "Research" page to download a copy. The US National Archives and Records Administration (NARA), in College Park, Maryland has the most complete collection of original manuscripts (except for the Air Force Series which are at the Air Force Historical Research Agency). NARA’s collection is available in either microfiche or paper format, although the microfiche collection is incomplete. Copies of the microfiche manuscripts can be ordered from NARA in either microfiche or DVD format. The original manuscripts can be photocopied, scanned, or photographed if they are not available on microfiche. The U.S. Army Military History Institute (USAMHI) at Carlisle Barracks, Pennsylvania also has a large collection of original manuscripts. The manuscripts can be copied on site using a photocopier or digital camera. Some of the studies are available for download from USAMHI’s online Military Heritage Collection. The U.S. Military Academy Library at West Point, New York and the Combined Arms Research Library at Fort Leavenworth, Kansas have copies of many, but not all, the studies. Access may be problematic for some researchers since both libraries are on active military posts. The Air Force Historical Research Agency at Maxwell AFB, Alabama has the original Air Force Series manuscripts. Most of the manuscripts can be downloaded from their web site. 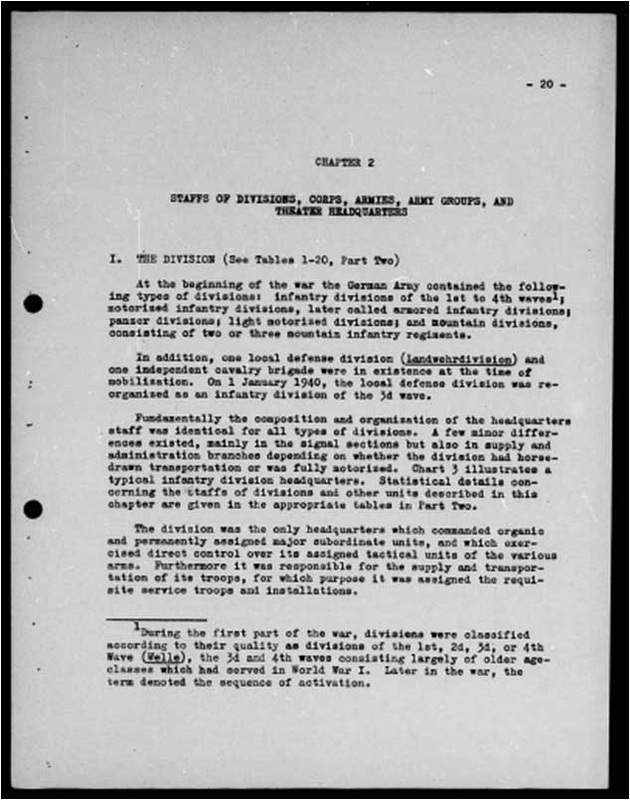 Outside of the United States, copies of the studies are reportedly held by the Canadian Military History Office in Ottawa and the Bundesarchiv Militärarchiv Freiburg. It is likely that a collection also exists in Great Britain, although no further information in known at this time. Over the years, most, if not all, FMS manuscripts have been copied by various commercial and private organizations. A number of U.S. universities have the microfiche collection. More than two hundred of the manuscripts were published by Garland Publishing (NYC) as a twenty-four volume World War II German Military Studies series in the late 1970s and early 1980s. Online. Various web sites have a few of the FMS available for download. One site that has an ever increasing number of studies is www.sturmpanzer.com. Thanks to Richard Hedrick of www.sturmpanzer.com for much of the information in this post.